If I had to pick one favorite candy, it's the peanut butter cup. Especially the miniatures. You know, the ones where you start with just one and somehow end up with ten wrappers. What, that hasn't happened to you? They're addicting, I tell ya. Needless to say, I really-really-really love them. One day I had the thought to throw one of the miniatures into a chocolate cupcake, because hello? Who doesn't love a nice candy surprise in the middle of an already sweet treat? 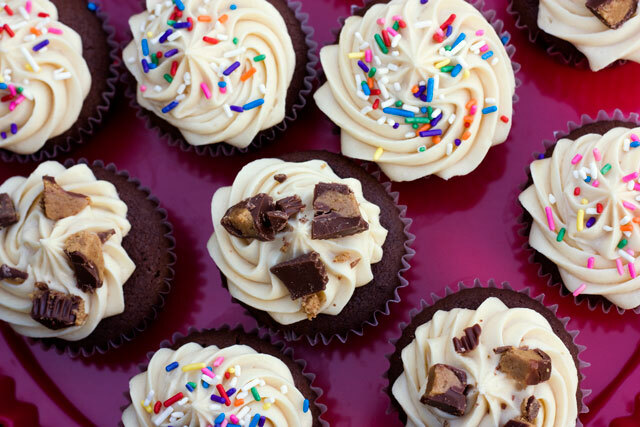 The only thing that could make these cupcakes better was a good peanut butter frosting. And this particular peanut butter cream cheese frosting is high up there on the lick-the-bowl-&-beater scale. I might as well have piped some onto a spoon or twelve. 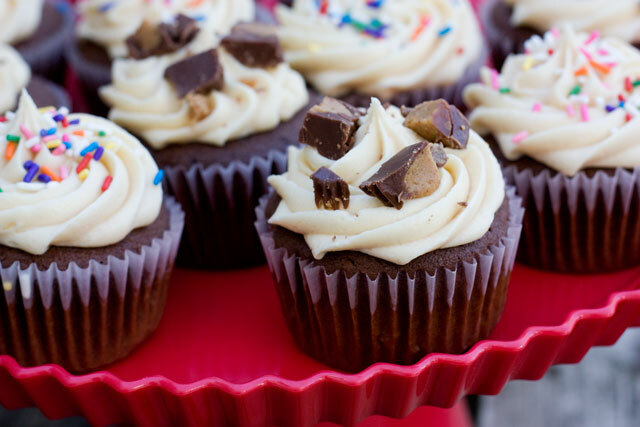 Then I chopped up the leftover peanut butter cups to garnish the cupcakes. But let's be honest. There were only about four leftover because I ate too many, so I topped the rest with sprinkles. Still just as delicious and a whole lot prettier. Preheat oven to 350*F. Prepare muffin tin with cupcake liners. In a small dish, whisk the hot water into the cocoa powder. In another bowl, whisk together the flour, baking powder, baking soda, and salt. Set aside. In a medium saucepan, melt together the butter and sugar over medium heat until fully smooth. Transfer to the bowl of a stand mixer and beat on low speed until the mixture is cooled. Add in eggs one at a time, beating until fully combined. Stir in the vanilla and cocoa/water mixture. Gradually add in the remaining dry ingredients alternating with the sour cream- beginning and ending with the dry ingredients. Fill cupcake liners 2/3 full with cupcake batter. Push one of the peanut butter cups into the batter in each liner. Bake for 16-18 minutes. Allow to cool in pan for a few minutes and then remove to cooling racks. Frost as desired and top with extra chopped peanut butter cups. Refrigerate when not being served. In the bowl of a stand mixer, beat together the butter and cream cheese. Blend in the peanut butter and vanilla extract. Slowly stir in the powdered sugar half a cup at a time until fully combined, being careful not to over mix. Frost cupcakes as desired. Wow, I also am I lover of peanut butter cups so these look really delicious.